The event, "A Night to SHINE Bright", is inspired by the life lived by eight-year-old Amara Weidinger. In what has become an annual event, “A Night to SHINE Bright” has kindness and faith at its core. 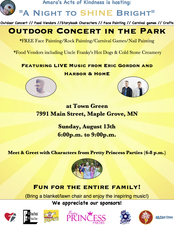 The free community event, hosted by Amara’s Acts of Kindness, is scheduled from 6-9 p.m. Sunday, Aug. 13 at Town Green in Maple Grove. At the age of five, Amara had an MRI finding which included multiple cystic lesions covering her brain and spinal cord. “No one could explain how Amara could be functioning and so she became a 'medical mystery' and her journey’ began,” according to her mother, Molly Weidinger of Maple Grove. At the age of eight, Amara passed away on July 26, 2012. While there was no official diagnosis, Molly said the cystic lesions were "glioma like" and eventually took over her central nervous system. There was no cure. Shortly after, one of Amara’s friends founded Amara’s Acts of Kindness. A year later, A Night to SHINE Bright began. 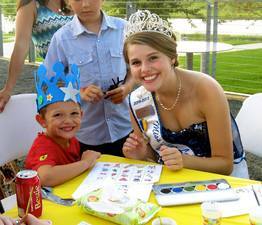 For 2017, the Aug. 13 "A Night to SHINE Bright” event is free and open to community members. The main event takes place on the stage at Town Green with other family-friendly activities taking place such as rock painting, carnival games with prizes, nail painting, face painting, and more from 6-9 p.m. There is a cost for concessions and food from vendors. “The goal of ‘A Night to SHINE Bright’ is simply to be a light onto the community - to offer a free event that is open and fun for all ages,” Molly said. “There is so much 'darkness' in our world, this event is meant to give people hope, love, and light. It also inspires others to take the 40-day pledge to do an 'act of kindness' each day. We all have a light inside of us...sometimes we just need to ignite it!” Molly said. The event includes a kickoff music by Eric Gordon and his band which includes a mixture of worship songs in honor of Amara and songs from his new album called "Nobody Said That It Was Easy.” The evening concludes with music from alternative rock band Harbor & Home. Approximately 50 volunteers dedicate their time to host the community event each year. “We welcome donations and this year all of our proceeds will be used to bless local MinnesotaTeen Challenge clients and their families. Amara would have been 13 this year and her heart always went out to teens/adults who were struggling in any way,” Molly said.